One of the most exciting parts about an all new Mustang is that the aftermarket will be working overtime to come out with their own versions of the car. While it be quite a few months before we see anything for real, that doesn’t mean imaginations can’t run wild. Yesterday we showed you a rendering of an over-the-top customized 2015 Mustang by Galpin Auto Sports, and Steeda has now followed that up with a depiction of their own 2015 Mustang. While the rendering from GAS seemed more like an artist running wild, this latest rendering from Steeda actually seems more realistic. The visual modifications are in line with the company’s current turn-key Mustang lineup, with black hood and side graphics, a Steeda windshield banner and black wheels. Simple, yet tasteful. We can’t wait until Steeda gets their hands on a 2015 Mustang for real. 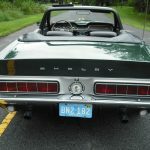 This entry was written by by Drew Phillips (Mustangs Daily) and posted here on Friday, December 6th, 2013 at 4:21 pm and is filed under 2015 ford mustang, 2015 mustang, 2015 steeda mustang, News, steeda. This article was not written by us, rather gathered using RSS feeds listed here. We take no credit for this article. You can leave a response, or trackback from your own site.